Plants bright red, up to 5 cm tall, with scattered pale/yellow patches and sometimes areas of iridescence. Fronds very variable in size (from 10-15 mm tall and 2 mm wide to 5 cm tall and 10 mm wide) , narrowly wedge-shaped, linear, irregularly lobed or incised; numerous microscopic veins present; blades monostromatic except for microscopic veins. Tetrasporangia in sori, one per apical thallus lobe; cystocarps scattered in blades, projecting from both sides but with single ostiole. Recorded from Cape Peninsula to northern Kwazulu-Natal (17-58). 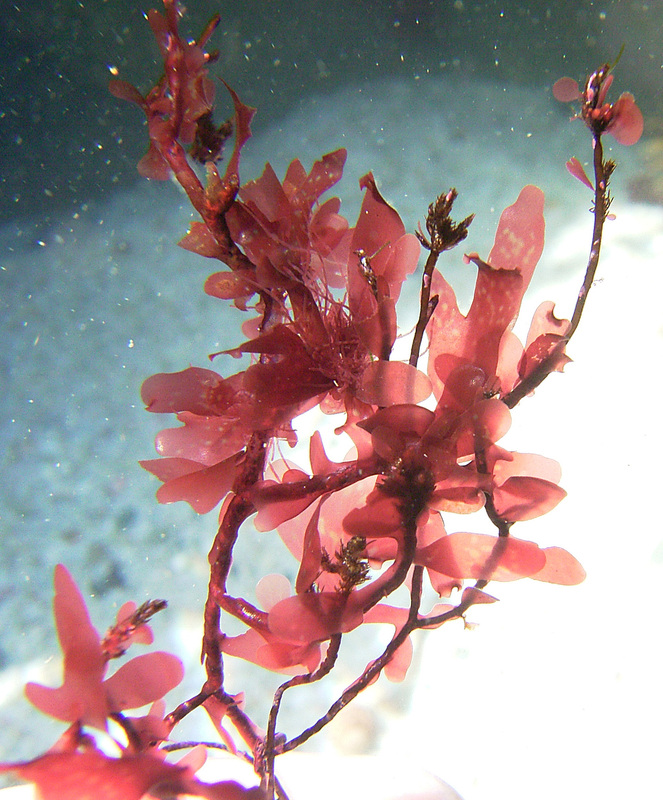 Epilithic or commonly epiphytic; frequent in rock pools, lower eulittoral and sublittoral (to at least 12 m). World distribution: Angola, Namibia, South Africa, Mozambique and also recorded from Sri Lanka (Silva et al. 1996). Type locality: Cape of Good Hope, South Africa (Silva et al. 1996). Note: This species differs little from A. acrospermum. Specimens of A. maculatum from the south coast appear to be slightly smaller than the largest specimens from the west coast, which may grow to 10 cm. Acrosorium maculatum growing on axes of Phloiocaulon suhrii, De Hoop. 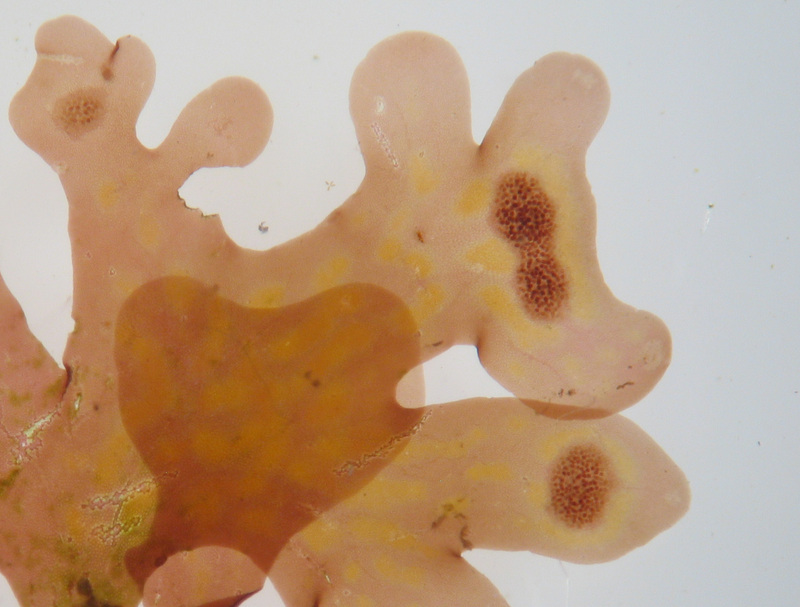 Acrosorium maculatum with pale yellowish spots and tetrasporic sori. 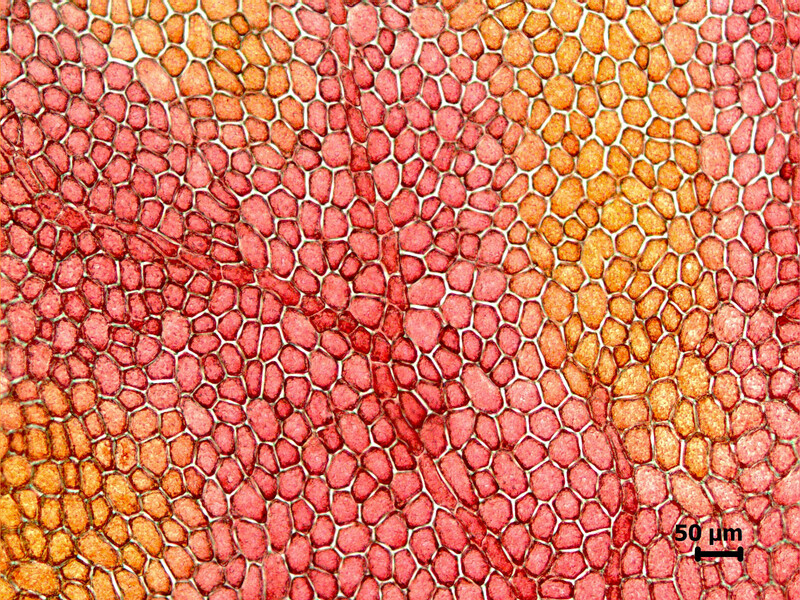 Acrosorium maculatum highly magnified view of thallus surface showing veins and yellow areas. Acrosorium maculatum. 1. Habit, tetrasporangial. 2. Apical region. 3. Surface view of cell arrangement. 4. Cystocarp in cross section. 5. Tetrasporangial sorus in crosss section. Reproduced from Stegenga et al. (1997). 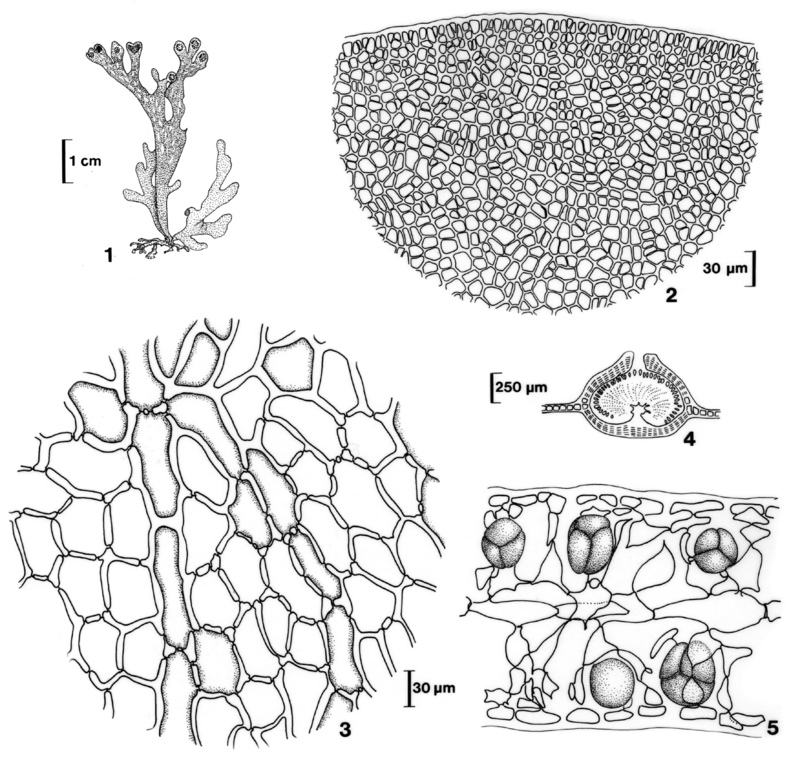 Papenfuss GF 1940a: Notes on South African marine algae I. Botaniska Notiser 1940: 200-226, 16 figs.